Ubud, in the lush green heart of Bali, is brimming with choice when it comes to accommodation. You can bag a bargain at a hostel, or splash out on a luxurious boutique hotel. But, to experience authentic Balinese living, opt for a homestay to really get under the skin of the island’s capital of culture. Whether you’re looking for a memory-filled family accommodation, a foodie haven, or a slice of luxury intertwined with Balinese tradition, a homestay is the perfect solution. Staying with a family offers a unique insight into the local way of life in Ubud. Not to mention that homestays are budget-friendly and usually come with a home-cooked breakfast included in the price. Here are our top picks in and around Ubud. Close to all the action of central Ubud, but tucked away down a little street for a peaceful night’s sleep, Shiva House has it all. As soon as you arrive, you’ll be struck by the intricately carved wooden door flanked by ancient statues of deities. 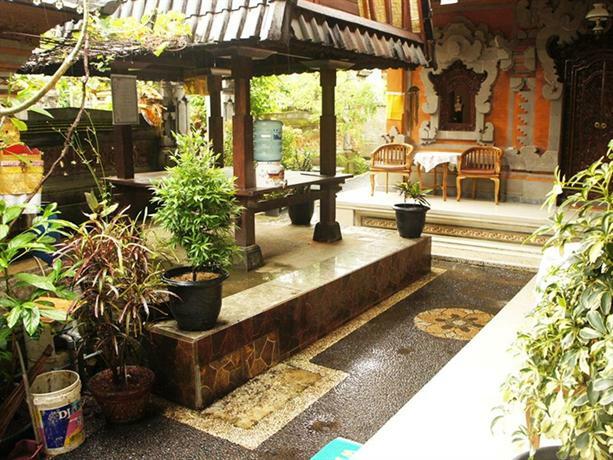 Wood-carvings and gold-tipped statues adorn every space of this traditional Balinese home. Each ensuite room has an ornate, wood-carved double bed. Enjoy a delicious breakfast from your own veranda looking out over a peaceful courtyard, while birds cheep in the morning air. Just off the main street of Ubud, this homestay is within walking distance of all the sights this bustling town has to offer. Part farm, part cookery school and part homestay, Pemulan Farm is the perfect place to indulge your taste buds while sampling the delights of a homestay close to Ubud. The cooking school is one of the best in the area and offers vegetarian and vegan courses, too. Start your day with a trip to the busy local market and rub shoulders with locals while you haggle over ingredients. The cookery school runs day classes, but for the full experience spend the night in the family home. Enjoy a seven-course cooking experience led by an expert chef and, of course, indulge in your creation at the end of a long day. Permulan Farm is a working farm in a village outside of Ubud, so a night here is the perfect introduction to village life on the island. The Jati family have been practicing artists for centuries. If you’re going to stay in the art and culture capital of Bali, you might as well embrace it with a stay at the Jati family’s homestay. The bamboo rattan walls are covered in intricate paintings by the family and local artists. Explore every cosy gallery and craft shop in the area with a bike rental from Jati Homestay and return from the bustling streets of Ubud to a quiet haven on Hanoman Street. Through the accommodation, you can organise a trip to the many ancient temples around Ubud, and learn the ways of traditional Balinese family offerings and family prayer. Those looking to learn a new skill can take part in Balinese dance or yoga lessons. Privacy, peace and luxury are what await you at Pajar House. The secluded family home is based in Kelebangmoding, a village outside Ubud, so you can make the most of the verdant countryside in the heart of Bali. A cluster of lavish guest houses are set behind the main house. Each suite comes with a four-poster bed and private veranda. A free shuttle runs from Pajar House into the centre of Ubud, so you can sample the hustle and bustle of the markets, shops and galleries by day and return to your rural retreat at night. Cool off after a day of sightseeing in the swimming pool, surrounded by rice fields. The family can arrange village tours, rice paddy trekking, and hikes to nearby waterfalls. Suparsa’s is a family-run homestay where you’ll find one of the warmest welcomes in Ubud. It’s set on a quiet street just a 10-minute walk for the centre. With some of the friendliest and most welcoming staff in Bali, there’s no chance of homesickness here. There are air-conditioned rooms with new, comfortable beds for a good night’s sleep. Suparsa’s is within walking distance of the main market and sights of Ubud, so little legs won’t get tired sightseeing. Start every day with some of the best banana pancakes in Ubud, the perfect fuel for little explorers – the homestay offers a flexible breakfast time to fit any schedule. Set just on the outskirts of Ubud, Nirwa Homestay overlooks sprawling rice fields. The only sound at night is the chorus of frogs and crickets. It’s just a 10-minute walk from all of Ubud’s attractions, but a world away from the noise and chaos. Each traditional house is separated from the rest of the complex by lush tropical plants. The Nirwa family are happy to organise trekking and walking in the area around Ubud for the ultimate escape. Bicycle rentals are available to easily get you in and out of town, or through the surrounding rice fields. If you want to live out your Eat, Pray, Love fantasy, this is the spot for you.